Wes is one of the best-known birder/naturalists in Florida. A birder since the age of 5 in upstate New York, his family moved to St. Petersburg in 1962, and for over 50 years he has been involved in every aspect of Florida ornithology, from scientific research, numerous conservation projects, journal articles and book contributions to ecotourism and the fun of listing. As the State Coordinator of the Florida Breeding Bird Atlas Project from 1986 through 1991, he was one of the leaders of the biggest ornithological project in Florida history. 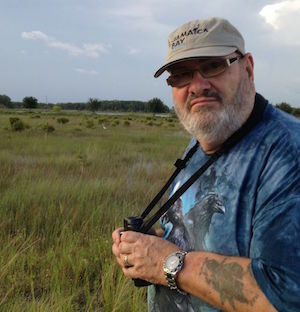 For the past 20 years he has been associated with the Space Coast Birding and Wildlife Festival as a field trip leader, presenter, judge and exhibitor. Wes is a founding member of the Florida Ornithological Society and is the compiler of the Zellwood/Mt. Dora Christmas Bird Count, considered to be the best inland count in North America. Wes has participated in & led over 200 pelagic trips in Florida and 11 other US states and Canadian provinces. He started leading field trips with the St. Petersburg Audubon Society at the age of 16, and for over 40 years has conducted birding tours as well as private guiding throughout Florida, North, Central and South America, and the Caribbean. Wes is also knowledgeable in many other areas of natural history and the history of Florida ornithology. He cherishes and makes good use of his extensive ornithological library. Competitive birding, or listing is a unique sport because most of the people who do it help the people with whom they’re in competition. If you question the notion that birding is a sport, check out the January 19, 2004 issue of Sports Illustrated! In the spirit of cooperative listing Wes has reached some lofty heights. With 490 species observed in Florida, (adhering to the American Birding Association Checklist and rules) he is in first place, and he’s ranked number 8 on the lower 48 states list with 797 species. He’s seen 801 species in the ABA area. (The March-April 2010 issue of Bird Watchers Digest has an article by “The Fat Birder” Bo Beolens entitled An Englishman in Florida that describes his 5 days birding with Wes.